"Stand therefore, having girded your waist with truth, having put on the breastplate of righteousness,"
Has asked for the city manager to be taken off the dias. Idea originally had broad support, but no other council member has said a word since Don challenged members to put their money where their mouth is. "I'm just planting seeds for what I think is going to happen in the future." "I'm going to predict that there's going to be a change in city [manager], but it's not going to happen right away." "The city is now a Leviathan." Re New Committee System: "The devil is in the details." Has asked to be assigned to CAMPO. Don will keep us informed of new developments. Konni Burton endorses repeal of Tuition "Deregulation"
(Austin, TX) Friday, Konni Burton announced her support of S.B. 233, legislation Senator Schwertner ﬁled to address the negative effects of tuition deregulation and the skyrocketing increase in tuition that has resulted. Texas State Capitol -- Earlier today, 2500 people marched on Texas' capitol to demand the 84th #TXLEGE illustrate that "it is time for school choice in Texas." Because all children learn differently, a one-size-fits-all government school system is doomed to fail. The joyus celebration featured children, parents, and elected officials. Thank you Texas for supporting School Choice. 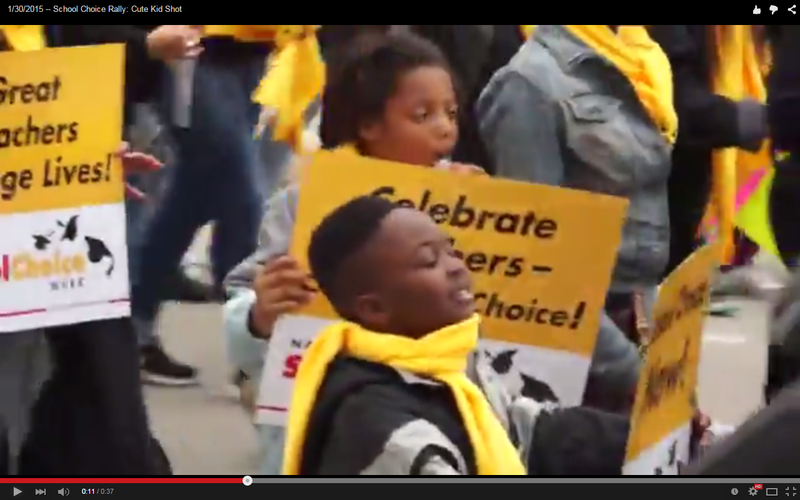 "With school choice every child gets a voice." "No child should be trapped in a failing, chronically under performing, school." The status quo "is a tragedy, created by government." "We can not allow status quo to dictate who attends the best schools in our state." "The time for the change is NOW!!!" "School choice will make our bad schools better and our good schools GREAT!!!" She was bullied in the government schools. The government schools forced her to choose between her education and her acting career. In her virtual school, she talks to her teacher "way more than ever before." Virtual school gives her more freedom and flexibility. Naively assumed her neighborhood school was ok.
Resented friends who sent kids to private schools. After giving up on government schools: "Thank God for school choice. Eventually sends her kids to a magnet school. Do not assume good ZIP codes ensure good schools. Construction does not equal instruction. Texas school districts employ 642,000 employees, only half of whom are teachers. Texas leads the nation in growth of administrators. Not all children have the same educational needs. By teaching in a private school she has flexibility to do her job. I can make learning fun. Too many students are stuck in destructive situations. In the past, when the old system stopped working, people did something new. Had a student who only learned English in a charter school. These charges were always desperate and silly; it's good to see the Travis County DA admit that (after the election). Rich people already have school choice; if you're poor, you're confined by ZIP code. Republicans want the dollars to follow the child, Democrats want the dollars to follow the bureaucrats. "No one cares more about your child's education than you." You have a lot of choices right now. eg. Charters vs. government schools. "As you make these choices, we here at the Travis County Republican Party ... will work to make sure you have even more choices." Too often we like to separate communities. The most important component of education is parents. It's the parents who really make the difference. "In the morning it happened that David wrote a letter to Joab and sent it by the hand of Uriah. And he wrote in the letter, saying, “Set Uriah in the forefront of the hottest battle, and retreat from him, that he may be struck down and die.” So it was, while Joab besieged the city, that he assigned Uriah to a place where he knew there were valiant men. Then the men of the city came out and fought with Joab. And some of the people of the servants of David fell; and Uriah the Hittite died also." The beginning of this session also marked an inauguration of little consequence but lots of barbecue, and a sound policy appointment from Governor Abbott to the UT System Board of Regents. 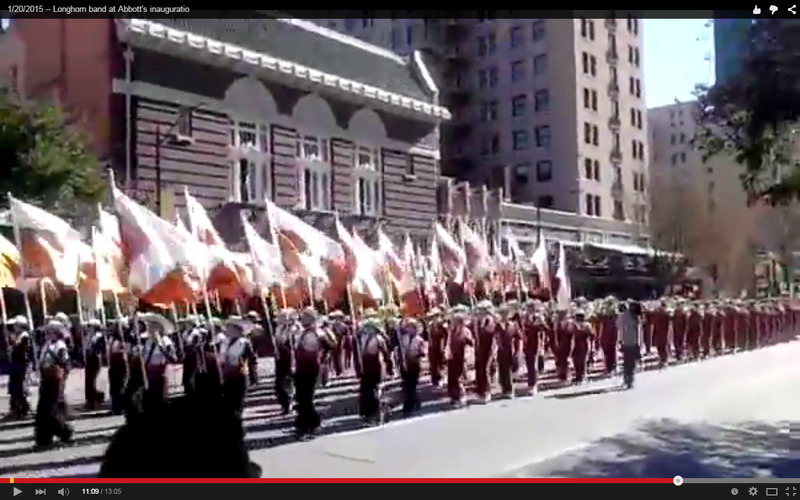 Inauguration of Dan Patrick and Greg Abbott. Defeated attempt to expand the impeachment committee. Good changes for conservatives in House rules. Biggest change was 2/3rds rule in Senate. Rumor mill says House committee assignments will come out at the end of this week. Pressure the Lite Guv to refer Constitutional carry to state affairs committee rather than Criminal Jurisprudence. No good piece of legislation passes automatically. Members care more about what their constituents think than "advocates." We can have a civil relationship with people with whom we disagree. Explain why you care about the issue. Keep literature to ONE PAGE. Don't trust staffers to take good notes. They don't want to commit on bills. Life Stories: Theirs or Yours. If legislators refuse to commit, ask them what they need then follow up. CWA has prayer chapters all around the state. Capitol Library on second floor will print out bills. Reassembling a coalition has been the most effective thing we've done in a long time. Legislators tie their retirements to district judges. HB 562 (Leach) - American Laws for American Courts. This has already been decided by the people of Texas. Loosely related to Focus on the Family. Life, Marriage, and Religious Liberty. Faith and Family Day February 24th. They deal closely with Parental Rights issues. Aycock sat on Tebow bill last session. Thanks to HB 2, there is only one abortion clinic remaining in Travis County; that being said, one is still too many. In her speech at the rally for Life on Saturday, Abby Johnson mentioned that the Planned Parenthood she used to work in would have a no-show rate of 75% when people would be outside praying and sidewalk counseling; that's an EXTREMELY effective way to protect babies. 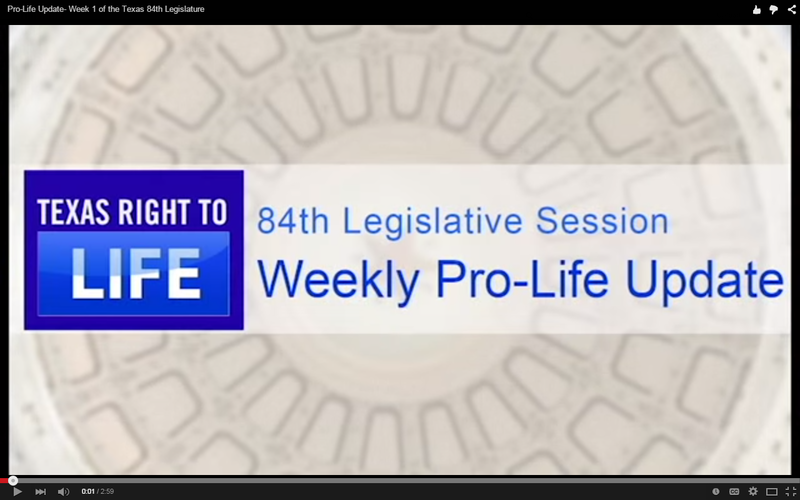 Central Texas Coalition for Life is partnering with 40 days for life for the next campaign. It begins on February 18th and runs through March 29th. To sign up or receive more information, click here. "Now the Passover of the Jews was at hand, and Jesus went up to Jerusalem. And He found in the temple those who sold oxen and sheep and doves, and the money changers doing business. When He had made a whip of cords, He drove them all out of the temple, with the sheep and the oxen, and poured out the changers’ money and overturned the tables"
"Looking at Jeb Bush as probably the person who stands the best chance; the question is, do we want to win?!?" Because nothing says victory quite like the family that has destroyed the Republican party on two separate occasions. "Because I was adopted, I always knew that family was a gift; I didn't always know that life was a gift." Birth mother was 13 at the time and had an abortion (at five months). Thought the Abortion was "successful." Turns out, she was pregnant with twins. Delivered at 6 months and three pounds. Survival required two years of intense medical treatment to fix what the abortion had done to her body. "Life is a gift, not a given." Abortion has a domino effect. "You are the salt of the earth; but if the salt loses its flavor, how shall it be seasoned? It is then good for nothing but to be thrown out and trampled underfoot by men." Today, Plano Citizens United, a coalition of local citizens, leaders and pastors, announced they have collected more than double the necessary signatures required to force the Plano City Council to repeal or place on the ballot the recently passed “Equal Rights Ordinance.” The ordinance threatens the religious freedom of Plano citizens and small businesses by criminalizing mainstream religious views about sexuality and gender. Legal experts have argued that the ordinance violates the U.S. Constitution, the Texas Constitution, and the Texas Religious Freedom Restoration Act. “The people of Plano have made their voice loud and clear – it is time to repeal this anti-religious freedom ordinance. The heroic effort of the Plano citizens in organizing and collecting signatures well above the required amount, during the Christmas season, only further shows how out of step the Mayor and Plano City Council are with the people they are supposed to represent. These LGBT special rights ordinances are designed to be used as weapons against people of sincere faith, as we have seen in Houston. 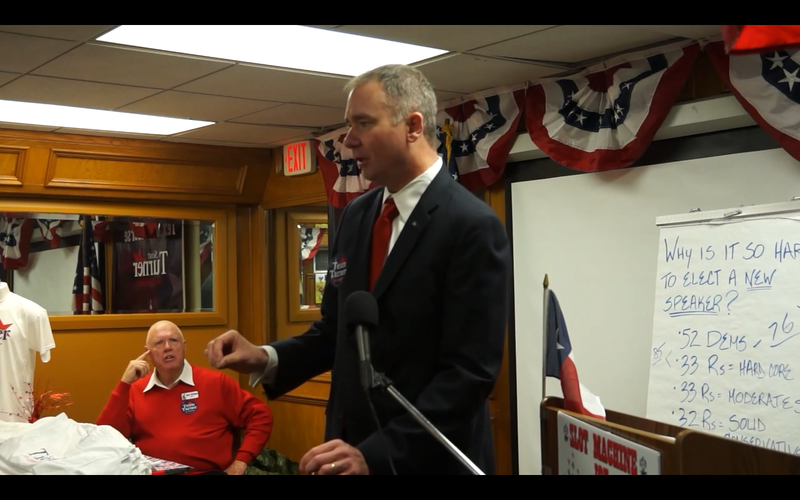 The people of Plano, just like in Houston, are ready to put an end to government hostility towards our First Freedom." Jonathan Stickland restores 2nd Amendment; Media Apoplectic!!! “It’s our version of open carry, and it goes a step further and we say it restores our Second Amendment to what our constitutional fathers intended it for it to be,” said Stickland. Gov. Greg Abbott announced his nominees to fill upcoming vacancies on the University of Texas System board on Thursday, and in doing so, sent clear signals about his vision for those boards. 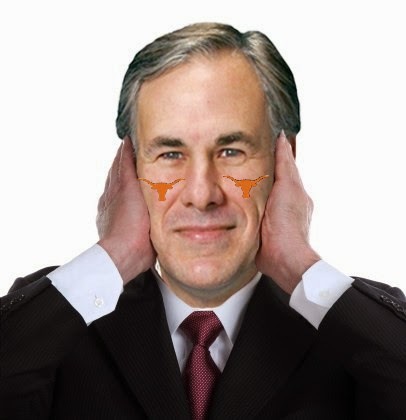 In an interview with the Tribune last week, Abbott was asked about two regents whose terms on the UT System board are almost over: Would his appointees more resemble Gene Powell, who served as the board's chairman during a particularly tumultuous time marked by tension with the University of Texas at Austin administration, or Steve Hicks, who was a vocal advocate of ceasing investigations into the flagship university that were contributing to that rift? "I want people who are dedicated to the job who will focus on bringing excellence to the organization," Abbott responded. "I will give them marching orders about what I want them to achieve, and I expect them to achieve it without micromanaging." That he was referring to the Hicks model became crystal clear on Thursday when Abbott re-appointed Hicks to the board. Powell and Bobby Stillwell, who was an ally of Hicks, will cycle off the board. Abbott also appointed Sara Martinez Tucker and David Beck to the UT board. First things first, Sarah Martinez Tucker served in the U.S. Department of Education during the administration of George W. Bush, which by itself tells you everything you need to know. 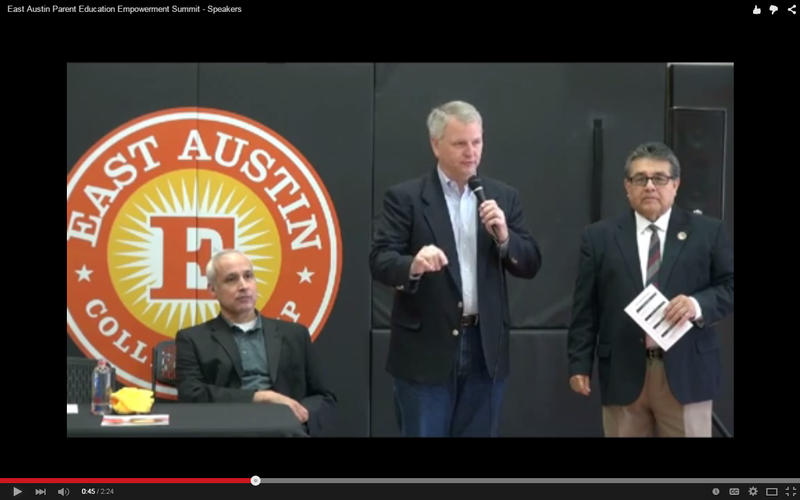 Next, Steve Hicks is the biggest apologist for Bill Powers on the current board. That would be the same Trey Martinez Ferdinand Frank Fischer who was Joe Straus' designated hatchet man on the Wallace Hall impeachment committee. The only criterion for receiving a donation from Friends of The University has been that the recipient shares our commitment to UT. In the early years the PAC supported staunch UT advocates such as Bob Bullock, John Montford, Bill Ratliff and David Sibley. More recently, it has supported top UT Austin allies like Joe Straus, Judith Zaffirini and Greg Abbott. Because nothing screams Republican like Bob Bullock and Judy Zaffarini!!! In late 2000 or early 2001, the [U.T. Law School] Foundation President, David Beck appears to have sent or e-mailed a “proposal” to UT-Austin suggesting [former Law School] Dean [and current University President Bill] Powers receive a deferred compensation. 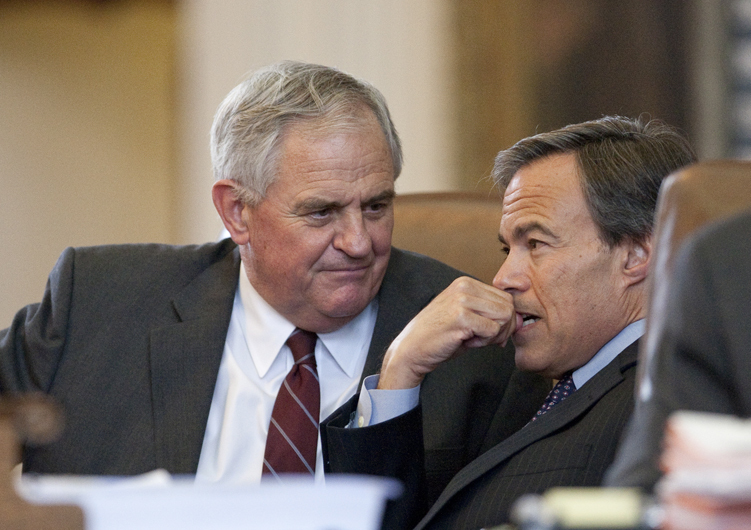 Bottom Line: The Texas Senate needs to kill these nominations. Update: It gets better, turns out Beck and Tucker both supported U.T. 's Affirmative Education program in 2013. Update II: Turns out Tucker is also a Common Core supporter. Despite strong public support, school choice will once more find vigorous opposition in the newly convened Texas Legislature. Conflicts over ideology, motivations–financial and professional–and even academic achievement are to be expected. One relationship that could ruffle some feathers if Rep. Jimmie Don Aycock, R-Killeen, is again appointed chair of the House Public Education Committee is the one between him and his daughter, Michelle Smith, a prominent education lobbyist. The public education industry presents formidable, often taxpayer-funded, opposition to many issues including school choice – and lobbyists are an important piece of that effort. For Smith, being Aycock’s daughter or a known education lobbyist has hardly been a secret. That other lawmakers are unaware of this relationship and the conflict posed defies credibility. And the Texas Legislature, when inclined, is no stranger to questioning the motivations of legislators or their lobbyist daughters. Wikipedia defines a conflict of interest as: "a set of circumstances that creates a risk that professional judgement or actions regarding a primary interest will be unduly influenced by a secondary interest." Clearly, the financial relationship between Chairman Aycock's daughter and the government 'education' industry is a 'secondary interest' that could 'unduly influence' the Texas House Public Education committee. 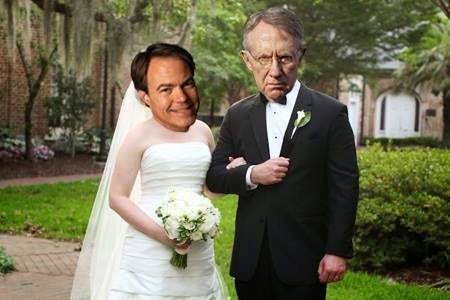 Give this incestuous relationship, shouldn't Chairman Aycock recuse himself from school choice bills?!? Update: Earlier this morning, this author asked Chairman Aycock about this issue at a Texas Tribune event; to his credit, JDA said he would recuse himself in the event any bill effecting his daughter's lobby clients came before his committee. "It's going to be really difficult to get private citizens like yourselves to step up and volunteer to serve on a board of Regents if when you're trying to do your job you're threatened with impeachment and potential indictments." "It's really important we get to the bottom of whatever we need to get to the bottom of." "I also don't think any legislator should take advantage of his position to have a child of his, or of a donor, get into a school when another child, who is qualified, didn't." Regents aren't supposed to be rubber stamps for the University administration. "As a fiduciary, you have every right, every responsibility, to the people you're representing on that board, to figure out what's going on." We had the first recorded speaker vote in 40 years. Big win in rules fight. 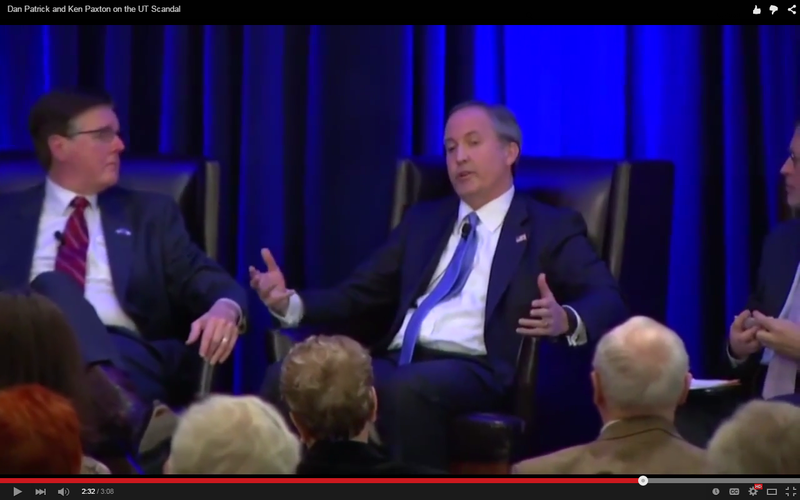 Konni Burton replaces Wendy Davis. 42nd anniversary of Roe v. Wade. "and for me, that utterance may be given to me, that I may open my mouth boldly to make known the mystery of the gospel"
Learn the rules for petitioning government. No signs or disruptive behavior (doesn't apply to Wendy Davis). Our opponents will use failure to practice decorum to silence us. "A lobbyist is a hired gun." There are rules about giving gifts. In a couple of weeks, committees will be assigned. "Points of Order" can cut both ways. 2/3rds rule -- Senate is supposed to consider bills in the order they come out of committee. Legislators care more about what constituents think than "lobbying" groups. Remember, they work for us. Tell the what bills you support. Before you leave the office, have them respond. "Does this sound like a good bill to you?!?" Asking a frillion questions about your life story. In laws can sue parents for "access" to children. Plano bathroom bill got enough signatures. American laws for American courts. More Harmony schools popping up. Author's Note: Good grief, there are at least 5 in Austin alone. Interstate compacts for Border Enforcement. With GOP control of Congress, forces them on record. Interstate compacts bypass the President; only require congressional approval. Start with the 25 states suing Obama over Executive Amnesty. "The state of Texas spends too much, borrows too much, and relies too heavily on the Federal government." Restore state spending to it's core functions. For years before a forgivable loan scandal forced him to resign as dean of the University of Texas Law School in 2011, Lawrence Sager was running up annual six-figure bills on a credit card paid for by the UT Law School Foundation. 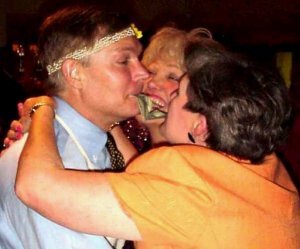 From 2007 to 2010, Sager racked up $401,498.29 on that card, all of it paid by the foundation, apart from tens of thousands in other expenses for conferences, computers, club dues, food, travel, storage units and other items. The report flatly contradicts an earlier internal investigation that attempted to absolve everyone at UT of any involvement in covering up an off-the-books compensation program at UT Law that violated system rules. The new report describes “a climate of non-disclosure” around the program. Sager was so keen on keeping the details of his faculty perks program secret that he used public and private funds to settle a dubious lawsuit by a professor that threatened to expose the program, according to the new report. The new report, in contrast, faults Sager for keeping the program secret, despite a regents’ rule forbidding employees from accepting money from university foundations without approval by the chancellor. It gets worse; read the whole thing (including details about Bill Powers' compensation) here. A new report on the financial malfeasance at the University of Texas – released late on Friday afternoon before a long weekend – offers harsh criticism of a payola scandal begun when UT President Bill Powers was head of the law school. Without naming him, the report also serves to vindicate the investigation started by UT Regent Wallace Hall that House Speaker Joe Straus and his cronies have tried to silence. This new report only investigated the UT Law School’s so-called “deferred compensation” program operated in conjunction with the UT Law School Foundation. An investigation into the clout-abuse scandal is ongoing. Powers, who was forced to resign at the end of this semester, has seen his term helming the state’s flagship university marked by several financial scandals. Yet it has been revelations of a clout-abuse program, operated apparently through his office, which has resulted in lawmakers connected to Speaker Straus trying to silence whistleblowers. Throughout the Attorney General’s report are references to documents not being provided to investigators by the law school or the associated foundation. When UT officials refuse to fully cooperate with both their constitutionally appointed regents and law enforcement, it is indicative that perhaps there is even more trouble to uncover. UT is still playing hide-the-ball even with this report. It was sent to them on Dec. 31, but UT did not release the report ... until 4:30pm on Friday, in advance of the Martin Luther King Jr. long weekend. Again, given the role Joe Straus has played in trying to block investigations into the malfeasance, it should be noted that they did not release the report until fours days AFTER he was re-elected as House Speaker. It’s unlikely that Straus and his cronies cared about the payola scheme Powers hatched at the law school. 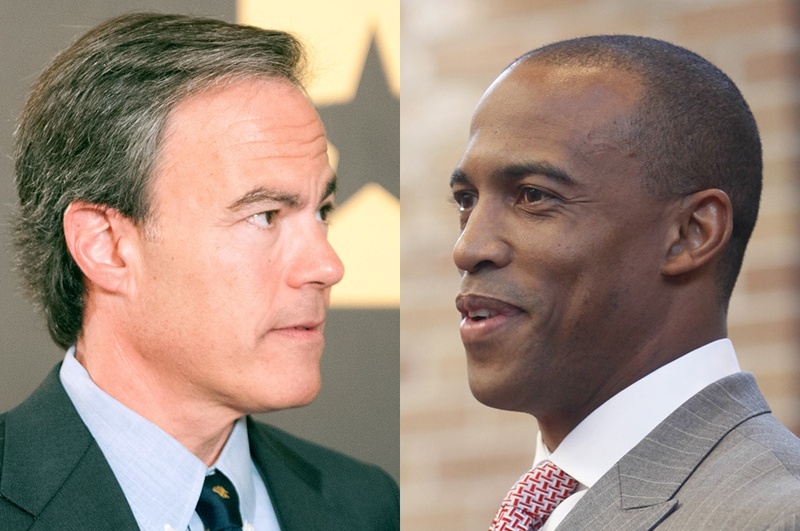 What’s abundantly clear is that Straus didn’t start attacking Hall and seeking to silence him, until after Hall apparently uncovered evidence demonstrating a pattern of politically motivated acceptances to the law school and other programs. Read the whole AG report here. Regular readers won't be surprised to learn that a film which gave the U.T. administration a conniption fit caught our attention. Furthermore, we understand the need to set the historical record straight about Lyndon Johnson. Ava Duvernay's masterpiece, Selma, does not disappoint. Selma catalogs the 1965 campaign designed to make voting rights too politically hot for Lyndon Johnson to ignore. At the time, despite passage of the 1964 Civil Rights act (which Johnson obstructed in 1957), local officials in Dixiecrat states enacted absurdly high barriers to voter registration. Johnson was determined to ignore the situation so that he could focus his political capital on creating new entitlements and expanding the war in Vietnam. Martin Luther King Jr., who led the campaign, chose to stand in Selma for political reasons. The Dixiecrat county government, which controlled voter registration, was notoriously hostile to civil rights. At the same time, the image-conscious City of Selma was (relatively) sympathetic to the protesters (most of the time). This dynamic enabled organizers to move (relatively) freely in the city while setting up the county courthouse as a media friendly setting for a confrontation with Dixiecrat county sheriff Jim Clark (who controlled access to the voter registration office). Nonetheless, King's presence was not universally welcomed among local activists. Selma uses FBI monitoring of King (originally ordered by Bobby Kennedy) as a plot device. In the film, Lyndon Johnson specifically orders the FBI to find out "what Martin Luther King intends to do next." The film depicts events like the murder of Jimmie Lee Jackson (enabled by Dixiecrat Governor George Wallace), Turnaround Tuesday, and the murder of James Reeb with a precision for which a seven paragraph review cannot do justice. 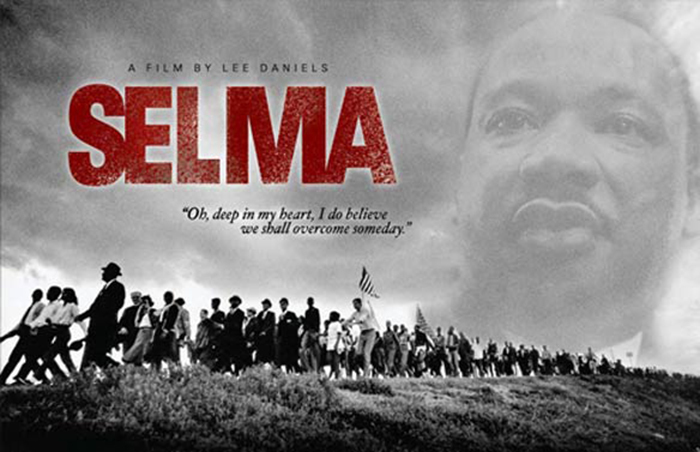 From the Dallas County Courthouse, to the Edmund Pettus bridge, to the Alabama Statehouse, Selma illustrates King's masterful use of the court of public opinion. Eventually, of course, events on the ground forced Lyndon Johnson to move on King's issue. While Selma portrays King favorably, the film is not hagiographic. The film deals openly with King's serial adultery. One of the most poignant scenes in the film depicts Coretta Scott King's heartbreak upon receiving proof of her husband's dalliances. Even here, however, the villany of Lyndon Johnson and his FBI is evident. Johnson ordered the FBI to send the (illegally obtained) recording to King's wife in a (vain) attempt to intimidate King into abandoning the Selma campaign. One artistic note: in addition to it's moving plot, Selma's cinematography is spectacular. While the scenes where people were beaten were tragic, they were an artistic tour de force that leaves the viewer feeling like events are less than 10 feet away. This author can only imagine the painstaking labor that went into finding costumes, props, and vehicles consistent with this 1965 period piece. Public opinion is the most powerful weapon activists can use to change government policy. Unfortunately, it is also extremely difficult to mobilize. In 1965, Martin Luther King Jr. and his allies masterfully choreographed their Alabama campaign to force a recalcitrant Lyndon Johnson to move on their issues. Ava Duvernay's Selma is essential viewing for anyone serious about changing government policy. Make them feel the heat until they see the light. 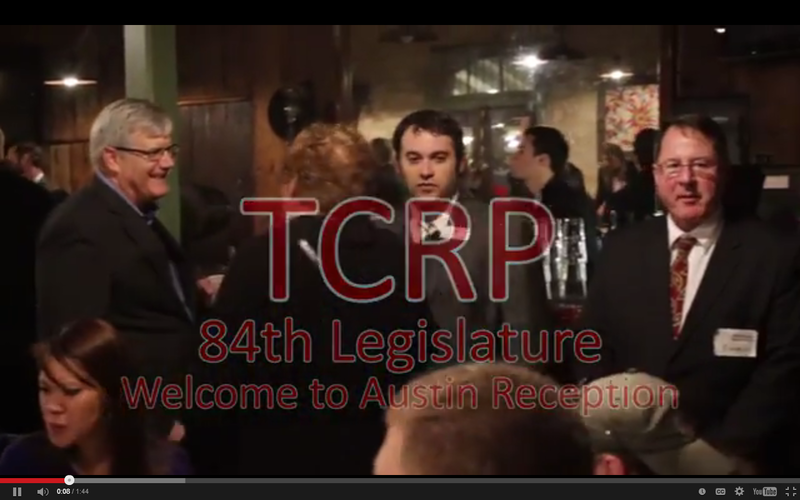 TCRP is a resource for elected officials from out of town. House Speaker Joe Straus released a two-year, $202.4 billion base 2016-17 budget Thursday that increases spending by 0.2 percent from the current budget and leaves $13 billion in state coffers. Straus’ budget increases general revenue, the portion of the budget that lawmakers have the most control over, by 3.9 percent from $95.2 billion to $98.8 billion. General revenue typically makes up around half of the total budget, with much of the remainder coming from federal funding. House officials said the budget avoids cost increases in part through cuts, but also through some unexpected savings. For instance, the budget spends an additional $1.8 billion in Medicaid, largely to address caseload growth. Officials last session had assumed higher cost increases were coming related to the implementation of the federal Affordable Care Act, according to a House official. “Some of the effects we thought we’d see from the ACA, if they’re going to materialize, they haven’t materialized as fast as we expected,” the House official said. Under Straus’ proposal, the state maintains public education at current per-student levels, accounting for expected growth of about 84,000 students annually. House officials said the funding will actually amount to a $2.2 billion increase in school funding because widespread growth in property values is leading to increases in local funding of schools. The House budget would put $396.8 million for border security, enough to continue funding of the state's high-profile border surge launched in June. In December, state leaders continued funding the stationing of hundreds of Department of Public Safety officers at the border through August, but wound down funding for the deployment of National Guard troops. Straus’ budget would continue keeping the current level of the DPS officers at the border, House officials said. Obviously, this proposal is lip service and doesn't reflect any sort of change of heart among House leadership; still, the fact that they feel they have to give us lip service is revealing. It's also interesting that they put water spending back "on budget." With the Senate on track to release it's own budget proposal next week, it's surprising how little negotiating room Team Straus has staked out for itself. Bottom Line: If the 84th #TXLEGE's final budget is similar to the proposal the House released this week, a lot of the contentiousness we've seen in recent years will become obsolete. Update: Straus' website has more information here. Texas only 14th (at best) for firearms freedom. No one should have to beg government to defend themselves. 7 states already have Constitutional carry. Highest priority for NAGR at state lege level. Can't compromise our basic rights. Current Texas gun laws "embarrassing." Constitutional carry does not abolish the permit system. We have strayed a long way in this country from the blessings of liberty. Constitutional carry is a priority for Texans. The real question is going to be the committee chairs. Update: NAGR sent out the following press release. 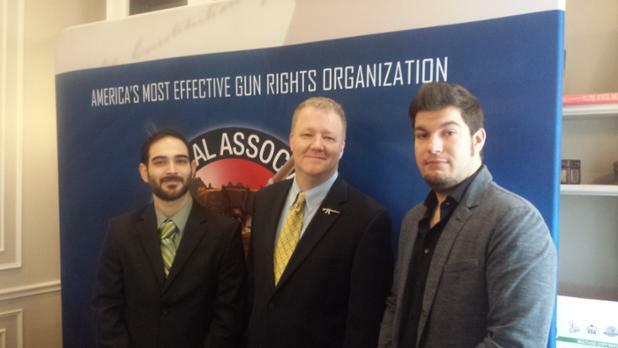 AUSTIN, TX- The National Association for Gun Rights (NAGR) is excited to be working with Senator Don Huffines and Rep. Jonathan Stickland to pass Constitutional Carry legislation in Texas. Representative Jonathan Stickland filed Constitutional Carry bill H.B. 195 early in the House in November 2014. With 350,000 Texas Gun Rights (TXGR) members, and over 4 million National Association for Gun Rights members nationwide, TXGR and NAGR are America’s fastest-growing and most effective grassroots gun rights organizations. These are not great times to be in public office. Gridlock in Washington has left little confidence in elected officials at any level of government to address big challenges. This inaction on pressing national issues fosters frustration and cynicism among the public. But just like many of you who lead Texas counties, we in the Texas House of Representatives believe there’s a better way to do things. We know that voters want us to build consensus around solutions that affect their everyday lives and our shared future as Texans. We also understand that rapid population growth leaves us no other choice but to address some very serious challenges. Working together to produce meaningful solutions: that’s what happens in county courthouses every week and that’s what will continue to happen in the Texas House. Here’s hoping Washington will begin to follow the example we’ve set. The Texas Association of Counties (along with the Texas Association of School Administrators and the Texas Municipal League) is one of the big three of parasitic taxpayer funded lobbyists in this state; for Joe Straus to place an op-ed in their publication tells you everything you need to know about Joe Straus. Was personally illegal until Reagan's amnesty in 1986. Affirms "Young people who played by the rules." With Obama's amnesty we have to do this. "Attacking some of the most vulnerable people in our society." Author's note: The irony would be hilarious if it weren't so tragic. Moral imperative to educate all children. 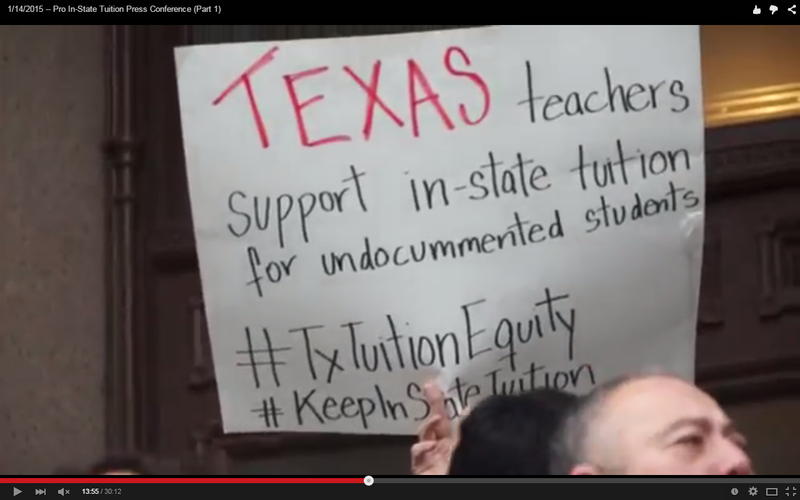 Illegals deserve in-state tuition "perhaps more than other Texans." Message to Stickland et. al: We'll lobby against the bill. In state tuition gives Hispanic children "hope." "Dallas ISD stands with" illegals. Sister was raped and murdered. Went to college on in-state tuition. "Don't take my life away again." Most of her family works for government. Something, something, sob story, education. Education = "Basic Human Right." 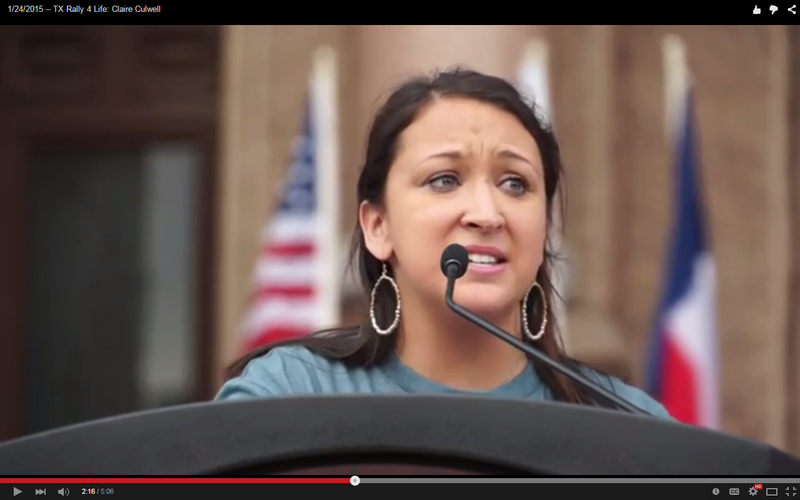 In state tuition = "Human Dignity"
"Everybody came here except the Native Americans." He was brought to U.S. illegally. First person in his family to attend college. "I too am a son of immigrants." Straw man argument about "hateful rhetoric." Calls opposition to in-state tuition "ungodly." Tried to redefine issue as being about "geography" instead of "politics." Texas State Capitol -- In the end, we got 19 votes. It seems disappointing (thought it's actually four more votes than this author expected), but it's progress. The first recorded speaker vote in 40 years was a necessary step; Joe Staus' supporters now own the 84th's legislative output. To quote Scott Turner: "No more smoke and mirrors." I was given information, in confidence, about how the final lobbying push went down, but the details are irrelevant. Members were pressured intensely by Team Straus, yet knew voters back home would not appreciate individual members voting for him. [David] Simpson's withdrawal allowed legislators to avoid the wrath of either. "Whether they do the right thing or not is secondary to the fact that they have to choose." They chose wrong, but they own it. "Now therefore, fear the Lord, serve Him in sincerity and in truth, and put away the gods which your fathers served on the other side of the River and in Egypt. Serve the Lord!" "You're not supposed to be here right now." "This is going to the the first time in 40 years there's going to be a vote...about two separate visions of Texas." The decisions no longer get made in back rooms. "I appreciate that when he campaigns he says the right thing, I don't appreciate them doing what lobbyists say when they govern." Anyone who votes for Straus is going to own the record of the Texas House. "They campaign on our message, it's up to them to deliver." "If they vote for the incumbent [speaker], they will put to rest the lie that there's anything different between Washington D.C. and Austin." People of Texas expect big things. Members of the Texas House have a choice. In election after election, conservatives won.